This is part 2 of a 2 part post. As before, if you can't stomach reading the entire thing, scroll down for the TL;DR version. 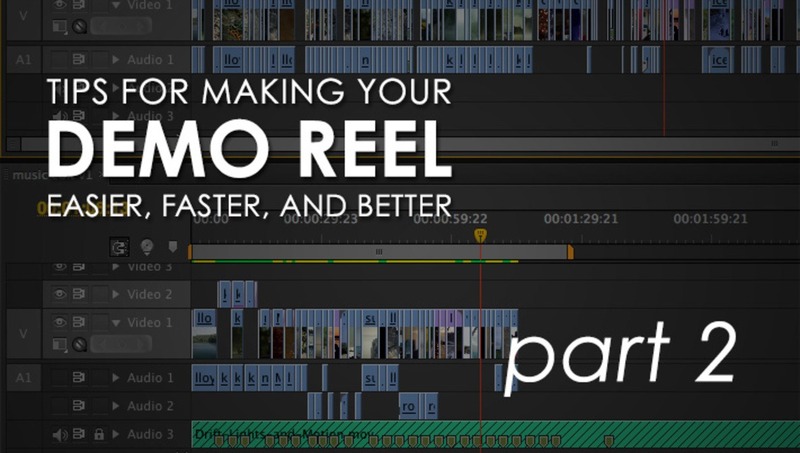 To recap part 1, head over to that article here, which will take you through the first steps in preparing to edit your new video demo reel. Everyone has their own methods of editing, and knows what works for them. Feel free to cut to your hearts content from here, but after having done this a few times, here are my suggested techniques for different approaches to your edit. ANYTHING THAT ISN'T AWESOME OR VERY RELEVANT TO THE KIND OF WORK YOU’RE TRYING TO GET SHOULD BE CUT. Once you've made it to the end of the "Pass 2", you hopefully will have cut a good amount of clips, but chances are you will still be left with too much footage. Just repeat the process! Duplicate "Pass 2", rename it “Pass 3”, and keep trimming the fat oink oink. 8. Start cutting to music. Even if you still have 10-12 minutes of total footage left, make a new blank sequence. Stack your latest “Pass X” sequence above it like in the example below. 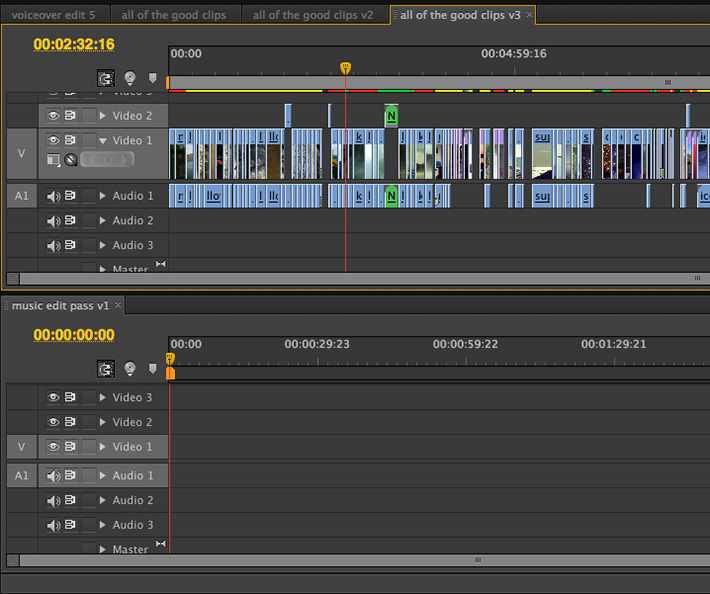 The benefit to editing like this is that you can drag and drop clips from one sequence to the other! Add it to your blank sequence now. Then go ahead and build the first few minutes of clips on the sequence with your music. Think about natural groupings of clips, if they exist, or clips that you can do creative edits with (match cuts, pans or rack focusing through dissolves). Finding the right music for your project is a whole other article, so I’ll just leave this link here if you need some resources for finding music. Watch some example reels from part 1 and get some ideas for the genre of music that might work best and go from there. My time saving tip though, is to build that first few minutes of the rough edit, and audition it with different music tracks you find. Experiment! You don't need to download or hijack the music, you can play it from the website it is hosted on while playing your video sequence. This will be easiest with a dual monitor setup, but you can move your windows to make it work. If the energy and flow of the music jives with your clips naturally, you might have a winner. Once you've found a track that works well, add markers to the track where the music hits notable beats or has moments that would sync well with a clip change or transition. This will help to make trimming your edit points WAY easier, and selecting what clips should go where. Below is an example of the music clip I used, with plenty of markers to guide my edits. 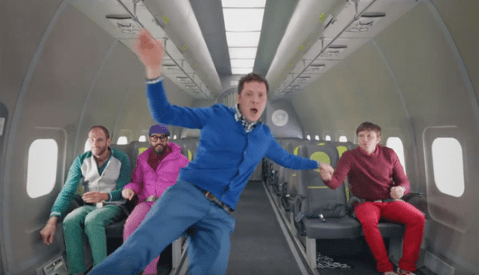 If you're making a demo reel that’s primarily to get new music video projects, you might consider asking the artists for use of a segment of their song in your reel. If not though, be sure to select music that can work with the varied styles of footage that might exist. Once you have a decent edit going, you may feel inclined to add some graphics. A header/footer title is great, and contact info would be good if you're putting it onto a DVD (does anyone still do DVDs?). Most reels I see are on Vimeo, and a lot of users have their email addresses or other contact information posted nearby. If you're not a graphics person, don't sweat it– keep it simple and just stick to your footage and your name at the front and/or back. Share your work everywhere! Blast it out on social media outlets, and tag it with keywords that are relevant to the genre of work you're trying to get more of. For example, if you've made a new reel of wedding footage, tag it with wedding-oriented keywords. I’ve looked at plenty of reels, and made at least 5 or 6 of my own in the last 10 years. My suggestions are just that, so feel free to get creative and break from the mold of most reels out there. It could definitely lead to you having a reel that stands out from the crowd, and clients might take note. I'm happy to discuss editing techniques or different approaches if you have them, so feel free to leave me a comment below! • Determine your audience; Are you seeking work from a specific industry or client type? • Use footage that is relevant to the audience or industry you identified. • Watch your finished projects and note on where the best clips are. • Open your old projects and slice out the clips you noted. 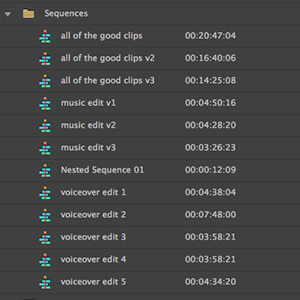 • Throw all your clips on a sequence, watch it, duplicate the sequence, cut out clips on the next pass. • When down to just a few minutes, play music in your web browser to audition it without downloading. 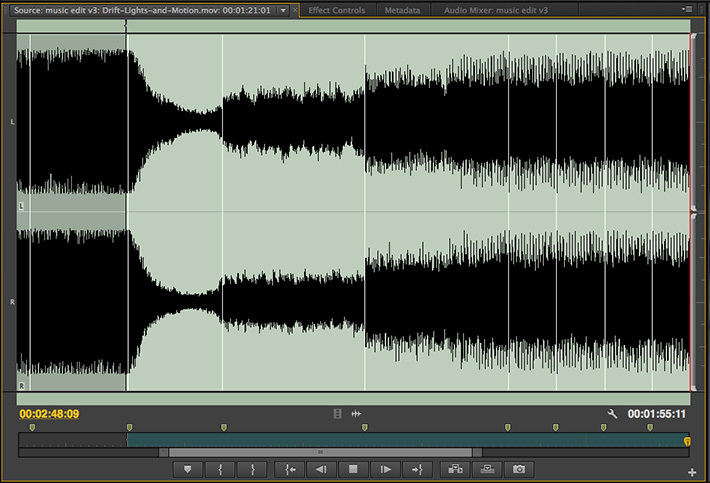 • Use markers while looking at the audio waveform to help guide your edit points. • Put your name in the front and end. Seems like a lot of work to do. Better hire someone ! I know this maybe an irrelevant question here, but does anyone know of any golden videography sites? I'm thinking if I get into video I'll be far more well rounded, but I really don't know where to begin in terms of what I should be shooting. What do you mean by "golden videography sites?" What is your goal with learning video? I could suggest some sites if I knew what area you were looking to learn. just saw this! Sorry, I mean what you said. Just places where I can gain some solid knowledge. Mainly the editing, I'm fine with shooting, it's editing where I lack. I have premiere pro. I feel somewhat unsure of leaving this comment and editing reel link due to the length of time since any posts were made . However, I want to leave some thoughts just in case it is still being read. After all I stopped to read, so I am sure others have and do..Ok anyway, on with my thoughts. First, and I hope my work reflects this, but I have been editing video and audio footage for eight years now. I absolutely fell in love with it back in early 2007. I wont go into details of that, but i want to share my thought process for making my reel which I will link at the end of this post. I started a few months ago. But had scrapped it several times, for lack of "best" level footage. So I relocated temporarily to Minnesota from Wisconsin, and got access to better software. Then I took advantage of some timing and enhanced two music videos from the Yardbirds, the British pop/rock band founded in 1963. They are celebrating the 50th anniversaries of their songs "For Your Love", and Heart Full of Soul". Well the short of that is they were both posted by the band on their official Facebook page, and have received a bunch of attention. So Taking out the music, I added pieces of those clips, ,and added some other stuff. Basically I wanted the reel to have an antique feel. I added an SMPTE leader in the beginning . But I wanted the sound to be more futuristic, so I used sound effects that made it sound futuristic like. So It has an antique visual feel, coupled with a futuristic sound. The idea is telling an old story in a new, fresh way. And so here it is. I hope this looks ok. feel free to comment and share your opinions of my reel. Thank you for reading, thank you for viewing, and thank you for sharing of any opinions.